As an influential piece of American Furniture History, the elegant details and large panels of colonial style furniture has been popular for decades. 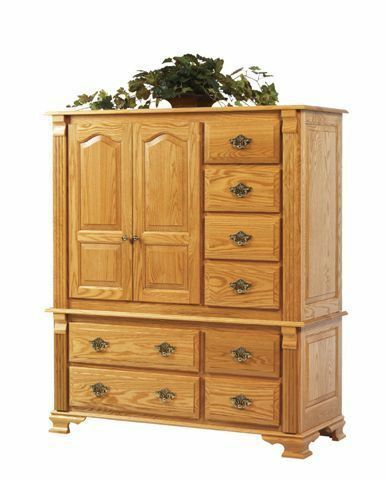 With the design cues of an Early American piece, and the modern woodworking techniques of our skilled Amish craftsman, the Journey's End Grande Chest will give you a beautiful storage piece to incorporate into your bedroom suite! With eight full-extension drawers, and a two-door cabinet that conceals four more drawers, you can be sure to have all the room you need for your clothes and linens in one convenient case piece. Add the aromatic cedar drawer bottoms for that beautiful, fresh scent all the time! Our Journey's End Collection is handcrafted from the finest hardwood that North America has to offer. Select from an array of different wood species and pair it with you favorite stain for the perfect chest to incorporate into your decor! Please call one of our Amish Furniture Specialists today to answer your questions and start your order by phone. We offer stain samples with all of our pieces to ensure you get the perfect finish to match your home! Call Toll-Free (866) 272-6773.